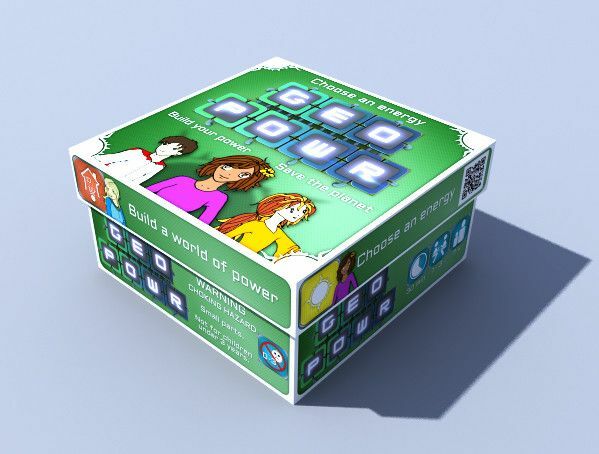 Geopowr is an empowering game for 1-3 people age 7+, and takes about 30 minutes to play. It's designed to be a fun and rewarding game, and the gameplay is easy to learn. The mechanics are mathematically grounded and offer layers of strategy to engage beginners and expert players. The planet’s population is growing and needs energy. Build the power your continent needs in order to win. Will you follow Thermalina, Hydroelectrica, the Wind Farmer, Oil Baron or Solar Goddess? 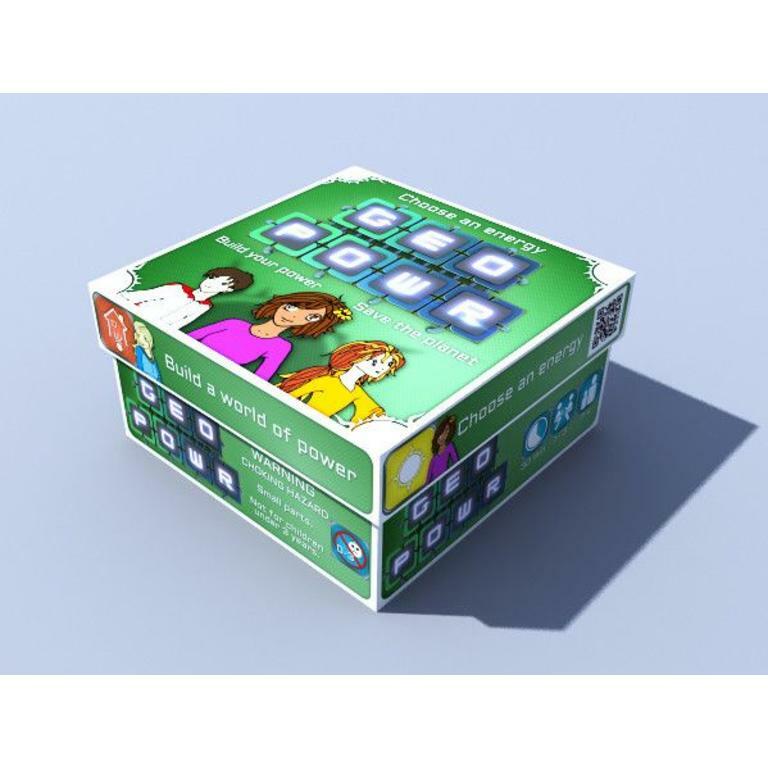 Shuffle the Energy Tiles and Action Cards, and give each player 3 Tiles, 1 Personal Mission Card, 1 Action Pad and Energy Cubes to represent their continent. Place another Tile face up in the middle of the table to show its energy quadrants and start the game. Put the Global Mission Cards face up and the remaining Tiles face down in 3 piles on the table. The player to the left of the dealer goes first, and lays one of their Tiles such that at least one of its quadrants connects to another Tile. At the end of your turn, pick up additional Tiles as needed to again have 3 Tiles in your hand. The next player then lays a Tile to connect at least 1 quadrant, and picks up another Tile, and so on. Players score 5 points by creating any pattern in which exactly 5 quadrants of one energy type are connected by sides (not just corners). A Construction Site is formed by connecting exactly 5 quadrants of one energy type and is denoted by placing an Energy Cube on one of its quadrants to show that is part of your Continent’s Area. If the opportunity is skipped because someone placed a Tile such that over 5 quadrants are connected, then the next opportunity to start a Construction Site is when 10 (or another multiple of 5) quadrants of the same energy are connected. Action Pads give you the options needed to build your way. 1. Play One Tile is the default move where you place 1 Tile on the board. 2. Play Two Tiles: place 2 Energy Tiles anywhere on the board in one turn. 3. Steal a Tile: take one Energy Tile from another player, lay 1 Tile and then give them back your least desirable Tile. 4. Swap a Site: take another player's Construction Site and then allow them to take one of Construction Sites. 5. Recycle Tiles: turn all your Tiles in and get a new set of 3. When a new multiple of 5 quadrants is added to a Site, a second Cube is stacked above the first to represent a Power Plant. When another multiple of 5 quadrants is hit a third Cube is added to make a Power Tower. More Cubes are added with each multiple of 5 that is achieved. The game is over when a player has played all their Cubes or cannot lay any more Tiles. Mission Cards give a player the bonus points shown on the card. Stop the increase of pollution while meeting demand for sustainable energy!